It's another deck mixed with the Felgrand structure! This time it's with one of my all-time favourite archetypes: Galaxy. I've had the deck built for quite some time, back when Guardian of Felgrand was revealed, but my initial focus was on improving my Blue-Eyes variant many of you are probably familiar with already (not mine specifically, just in general). So in an attempt to show something new and maybe exciting, I'm doing something I don't often do and posting it for show. If anyone chimes in with something I hadn't thought of, it's a bonus. 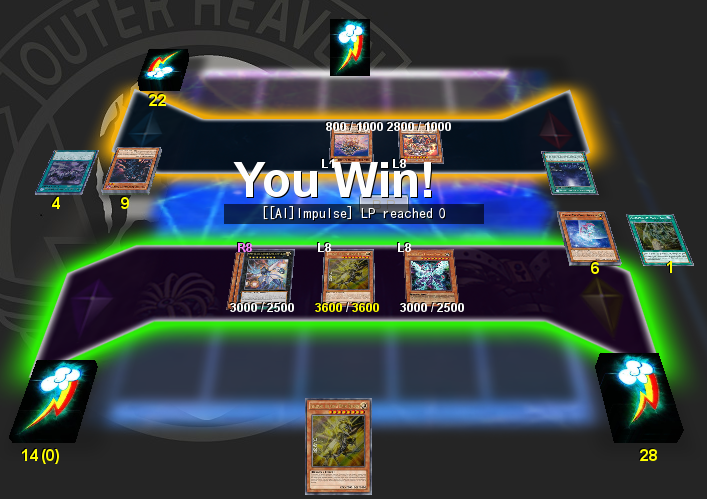 Here's a picture of it bullying the AI. A small disclaimer, many cards are there as filler, but several "questionable" choices are there for good reason. Any questions will be answered so have at it if you like. It's going to be a deck I work on for the foreseeable future so perhaps in a week or two I'll post an update. How do you feel about two Photon Stream of Destruction? They've worked out pretty well for me. Thanks to Arcbrave and Gospel, along with the usual support, there's rarely a shortage of Galaxy-Eyes on the field. If anything Tachyon Transmigration could be stand to be dropped to two as well. Do you think Galaxy-Eyes is good at 2 or 3? I prefer it at 3. Makes Trade-In more valuable since you want to avoid using Knight for it, Galaxy Soldier can use it for discard, as can any other discard card, and it's kind of a personal rule to use the primary dragon at 3. I feel as if you should probably drop a Galaxy-Eyes Cloud Dragon for another Paladin of Felgrand. Personally, I run Paladin at 3 in most of my builds because it functions as a Foolish Burial more-or-less. Though, running 3 may not work well in this deck. Also, nice concept! I really enjoy looking at decks that are different and/or unique. I tried three Paladins originally and it ended up being hit or miss since I usually get the dragons I want from the deck pretty quickly. Cloud Dragon would probably be better at 1 but I'm currently viewing it as a pseudo-Maiden that doesn't require being targeted. Ideally I'd love to make Dimension Wanderer more reliable since it's a fun card to drop on an opponent. Thanks, Galaxy is one of those decks I've constantly worked at to keep it playable, and thanks to Felgrand it's possible. SR02 is easily my favourite structure of all time. If you think of any other ideas I'm always open to them.